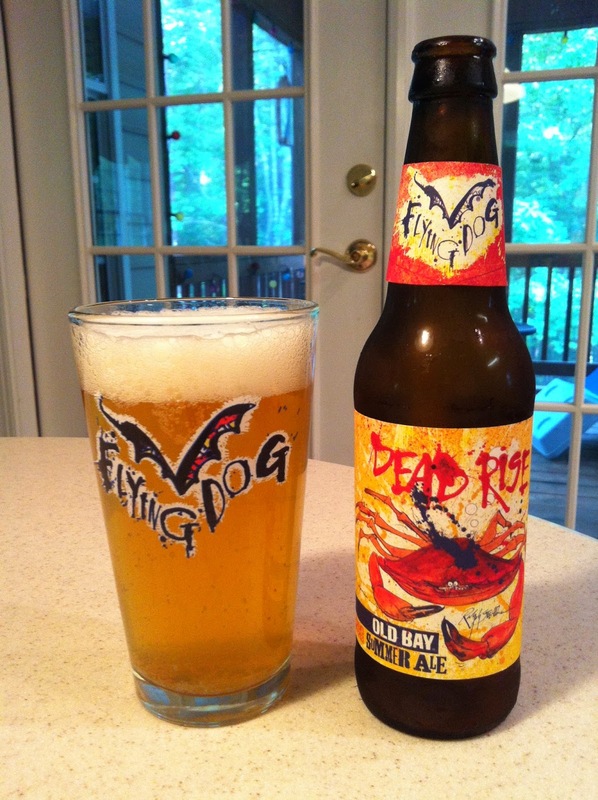 From the moment I heard that Flying Dog Brewery was making a beer with OLD BAY® seasoning I was intrigued. Growing up in Maryland, Old Bay was a staple on the table. Many a summer afternoon was spent consuming copious amounts of steamed crabs covered with the iconic spice. Heck, when we needed a break from picking crab meat, we'd spead butter on crackers and put OLD BAY on them! Shrimp, fish, even corn on the cob, the OLD BAY food pairings were endless. All these found memories aside, I was intrigued, but still curious — would this flavor combo really work? After a hot afternoon on the range, we were relaxing with some cold beer while waiting for dinner to finish cooking. Colleen was preparing BBQ ribs, and it seemed the right time to open the sample bottle of Dead Rise OLD BAY Summer Ale. I offered to share the bottle with my dining partners, but they declined, opting for more "traditional" beer flavors. Pouring my beer, the familiar smell of OLD BAY wafted forth. That was not unexpected, though I was mildly surprised at the aroma's strength. The beer poured a bright yellow color with a thick white head. Taking the first sip, the OLD BAY spice flavor was prominent. But it wasn't all OLD BAY spice. There's a lemony tartness in the background, as well as some hefeweizen-esque yeast and wheat flavors coming through as well. The finish lingers with a bit of citrus and pepper. As I continued sipping, the spiciness remained but didn't overwhelm. I was really enjoying this beer, but still offered a few sips to the others. Despite their initial hesitation, they too found the beer to be quite enjoyable. In fact, during dinner Colleen mentioned that she thought she would go out the next day and see if she could find any at the store. I have seen reports that the beer is selling out quickly. I found Dead Rise OLD BAY Summer Ale to be surprisingly refreshing. It's a light bodied beer, in spite of the robust and spicy flavor. I honestly didn't know what to expect, but I quite enjoyed this beer. I hope Colleen is able to find some for sale locally. That's now two beers from Flying Dog in recent weeks that I think we'll keep on hand this Summer. The first one I reviewed last month, Flying Dog Easy IPA, seems to be in high demand as well. The last time I made a trip to the beer shop, I grabbed the very last six pack in stock. I'll be keeping my eyes out for both of these now. A portion of the proceeds from Dead Rise OLD BAY Ale Dead Rise will go to True Blue, a program that advocates on behalf of the Chesapeake Bay’s 5,500 watermen and promotes sustainably harvested Maryland Blue Crab. Flying Dog has also teamed up with leading chefs in the region to create The Dead Rise Cookbook, with recipes featuring Old Bay seasoning. The proceeds from the cookbook will also help benefit True Blue. I have the book in hand and we'll be reviewing some recipes from the cookbook in the near future as well. Haven't been able to find it here either. It sells out as soon as a shop gets it in.